Sometimes we need to synchronize some blocks of a code by the value of variable. The first one is a CashBackService that interacts with another (external) web application under the REST protocol. And in order to calculate the actual cash-back, we need to synchronize transactions with this application. Because the next amount of the cash-back may depend on the total amount of user payments. The second is an AccountService that communicates with an internal DataBase and store a data relate to accounts of users. In this service, we can use a JPA transaction to making some actions as atomic operations in the DataBase. In a real life, I’d strongly recommend to make a refactoring in such systems to avoid this situation as it possible. But in our example, imagine that we have no choice. 6 sends a request to the external system by REST API. 7 AccountService persists a data about the money transfer in the DataBase transaction. However, you can have several objects with the same value (userId - in the example), but the synchronization works on the instance of the object and not on its value. The code below does not work well, because it’s incorrectly synchronized, the static factory method UUID.fromString(..) make a new instance of UUID class on each call, even if you pass there an equal string argument. In this case, you need to obtain the same reference for equals objects to synchronize on it. This solution has a bad performance. You will block transfers of money for absolutely all users. And if you need to synchronize different operations in the different classes by the same key this solution not helps you at all. In order to ensure that the instance of the class (which contain a user ID) will be the same in all synchronized blocks, we can serialize it into a String and use the String.intern() to obtain the same link for equals strings. String.intern uses a global pool to store strings which are interned. And when you request intern on the string, you get a reference from this pool if such string exists there or else this string puts in the pool. Using the intern is not good practice, because the pool of Strings is difficult to clean with the GC. And your application can consume too many resources while the active use of the String.intern. Also, there is a chance that a foreign code synchronized on the same instance of the string as your application. This can lead to deadlocks. In general, the use of intern is better left to the internal libraries of the JDK, there are good articles by Aleksey Shipilev about this point. At the first we need to make a new synchronization primitive - the custom mutex. That will work by the value of the variable, and not by the reference to the object. It will be something like a "named mutex", but a little wider, with the ability to use the value of any objects for identification, not just the value of a String. You can find examples of synchronization primitives to locking by the name, in other languages (C++, C#). Now, we will solve this issue in Java. In order to ensure that the same mutexes are obtained for equal values of variables, we will make the mutex factory. 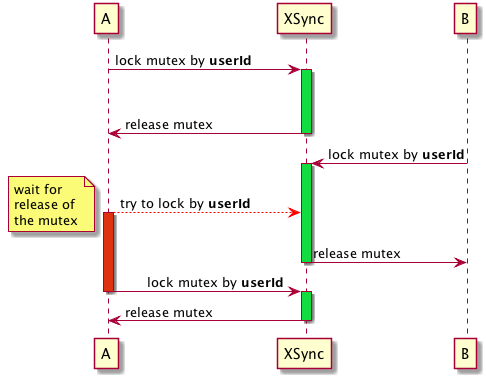 In order to return the same instance of mutex on the each of requests with equal keys, we will need to store the created mutexes. If we will store these mutexes in the simple HashMap, then the size of the map will increase as new keys appear. And we don’t have a tool to evaluate a time when a mutex not used anywhere. Our mutex factory will be based on the WeakHashMap. The mutex factory creates a new mutex just if the mutex for this value(key) is not found in the HashMap. Then created mutex is added to the HashMap. Using of the WeakHashMap allows us to store a mutex in the HashMap while existing any references to it. And the mutex will be removed from a HashMap automatically when all references to it are released. It’s very sad and a little later we’ll take a closer look at the reason. But for now, let’s consider an example of implementation, which is proposed by the official documentation (I mean the use of Collections.synchronizedMap). If we look at the code of the Collections.synchronizedMap then we find a lot of synchronizations on the global mutex which is created in pair with a SynchronizedMap instance. This solution does not have the best performance. All of these synchronizations are lead us to permanent locks on each operation with a factory of mutexes. We need to look at the using of the ConcurrentHashMap. 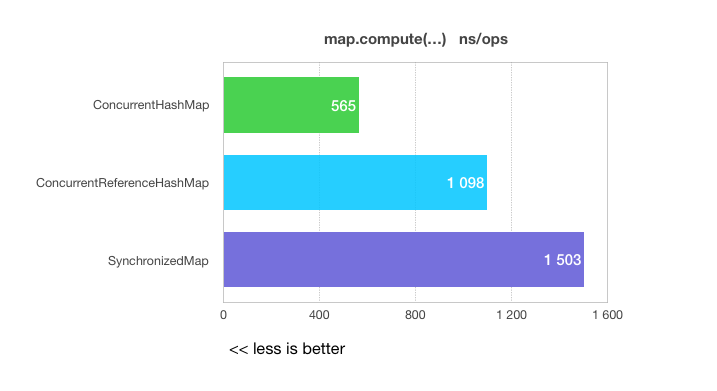 It has a better performance than Collections.synchronizedMap. But we have one problem - the ConcurrentHashMap doesn’t allow the use of weak-references. The first is to create my own ConcurrentMap implementation. This is the right decision, but it will take a very long time. The second one is the use of the ConcurrentReferenceHashMap implementation from the Spring Framework. This is a good implementation, but it has a couple of nuances. We will consider them below. * Creates and returns a mutex by the key. * then returns the same reference of the mutex. Less code, but more performance than before. Let’s try to check the performance of this solution. I made a small benchmark in order to select an implementation. I use the ConcurrentHashMap in benchmark just for comparing in measurements, this implementation is not suitable for use in the factory of mutexes, because it does not support the use of weak or soft references. All benchmarks are written with using the JMH library. So, the ConcurrentReferenceHashMap justifies its use in this case. I packed this code into the XSync library, and you can use it as a ready solution for the synchronization on the value of variables. In order to be sure that this code works well, I wrote several concurrent tests. 1 Create XSync instance for a synchronization by UUID value. 2 There is a magic here, we created a parallel stream and try to increment the same nonatomic integer variable in each stream. 3 Implementation of the does not thread safe integer variable. Issue requests and pull-requests are welcome.